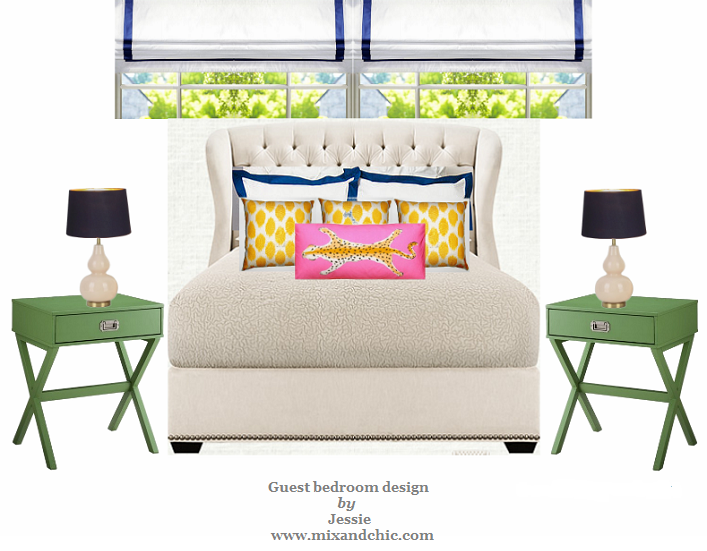 Mix and Chic: Our guest bedroom (work in progress) Part 1! I have always wanted to make over our guest bedroom but unfortunately, the plan always get postponed due to budget constraint. Luckily for me, the wonderful people at Arhaus agreed to provide me this gorgeous bed so I can get my overdue project started. A big thanks to Kimberly and her team for their generosity! Isn't she a beauty? 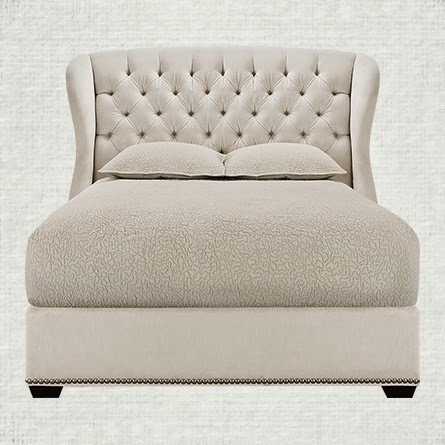 A beautiful tufted bed has always been on my wishlist, so I am especially thrilled to have this sumptuous bed in our home! Since our guest bedroom is quite small, I decided to get a queen size bed to make space for two nightstands and table lamps on either side of the bed. A few days ago, the bed has arrived, in great condition. The wonderful delivery guys wanted to help me assemble the bed initially but our old bed was still in the room so the new bed didn't get assembled yet. I have asked the delivery guys for assembly instructions. Fortunately, the instructions seemed easy enough. I am planning to get the bed assembled this weekend so I can show you what it looks like in our guest bedroom next week! Speaking of our guest bedroom, currently it looks like this. 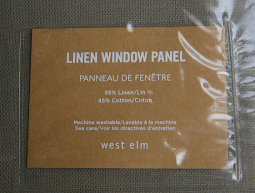 The blinds were inherited from previous owners. Nothing much was done to this room except painting over the light yellow walls and reusing the same pieces we had years ago. Such a bland, boring and basic room, isn't it? In my defense, the bed frame, bedding, nightstands, table lamps and pillows were purchased for our guest bedroom with a crazy tiny budget 9 years ago when we were still living in North Carolina. The story goes like this. Like many new homeowners, we were broke. With only a mere $1000 budget for new paint, a new bed, two new nightstands, two new table lamps, new bedding, new pillows, new curtain panels, new curtain rod, new mattresses and new box springs (yup, that was included in the budget as well) and a 3-week dateline, you can only do so much. Additionally, we didn't have a lot of good furniture options in our area. Ikea was a few states away and getting nice items online was out of the question since they usually cost so much more with shipping so we were stuck with what's available near our town. Despite the crazy small budget and the crazy short amount of time we had (less than 3 weeks), we managed to pull together the room on time and came in under budget. At that time, I was quite proud of myself considering it was my first decorating project and the budget challenge that came with it. I remembered getting the table lamps for $15 each (50% off) from Lowes and they were the starting point for the whole design. In case you are wondering, we purchased the bedding from Target and the cheapo nightstands for $29.90 each from Bed, Bath and Beyond. Yep, I still remembered what some of the things cost even after nine years because we were really mindful with our budget at that time. To be honest, I have never liked the old bed we picked but it was the only bed that we can afford at that time. Can you tell I am pretty psyched over our new bed and this whole makeover? 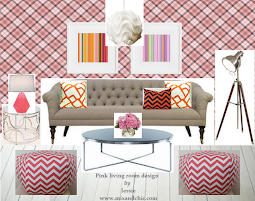 Here is what I have in mind for this room! What do you think of my design plan? 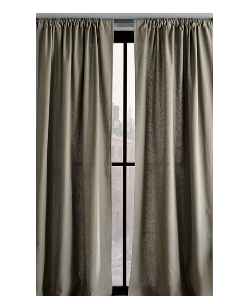 I already bought a few pieces for the room and am planning to order a few more items online. Stay tuned for another update next week! That bed is awesome! The room is going to be gorgeous! I might have been tempted to ask for a king and use it in my Master!!! I am so excited to watch you make over this room!! I love the design plan!! 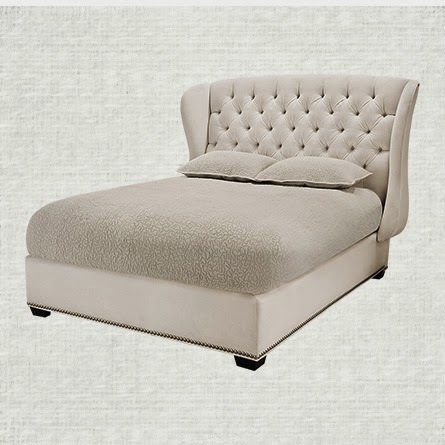 And the new bed is just beautiful; I can't wait to see it put together in the room. I'm excited for you Jessie! And excited to follow along with the progress!